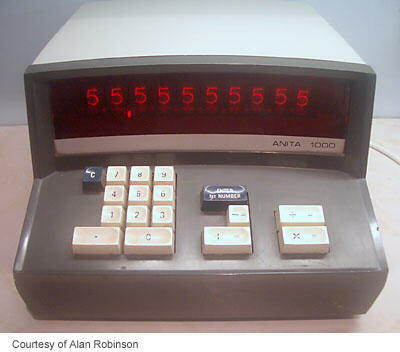 Distinctive features: The ANITA series that includes this model has a very distinctive design, unlike any other calculator. Employs LSI (Large-Scale Integration) integrated circuits. Uses 5 LSI (Large-Scale Integration) integrated circuits by General Instrument Microelectronics (GIM) - the metal cans in the photograph below. Dates from about late 1970 (the advertisement below is from February 1971). Cost £250 GBP (about US $625). The ANITA 1011 LSI is similar to the ANITA 1000 LSI but also has memory, %, and rounding. The first ANITA calculator series to use LSI integrated circuits. A very distinctive design, unlike any other calculator. 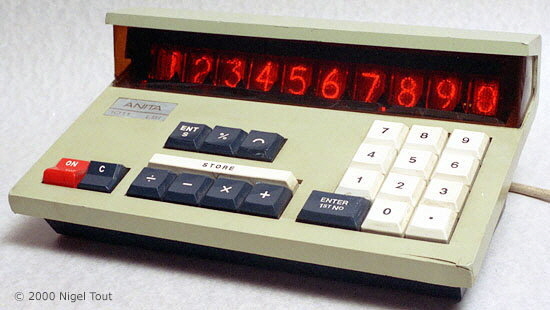 A portable version with built in NiCad batteries and charger was available as the ANITA 1011B LSI, shown in the Portable Calculators Section. ANITA 1011 LSI Operating Instructions (pdf format). 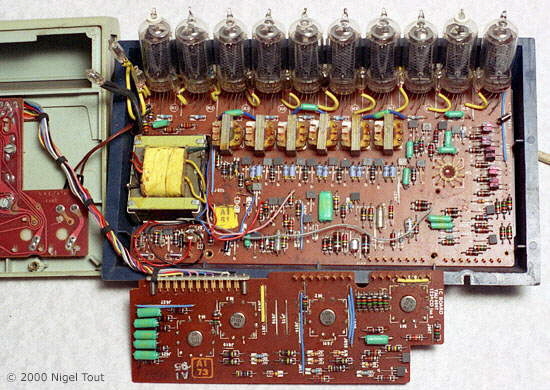 With the cover removed, showing the two circuit boards with integrated circuits in cans (four on the small board and one on the large board) and the Nixie-tube display. The Nixie-tube display in use. 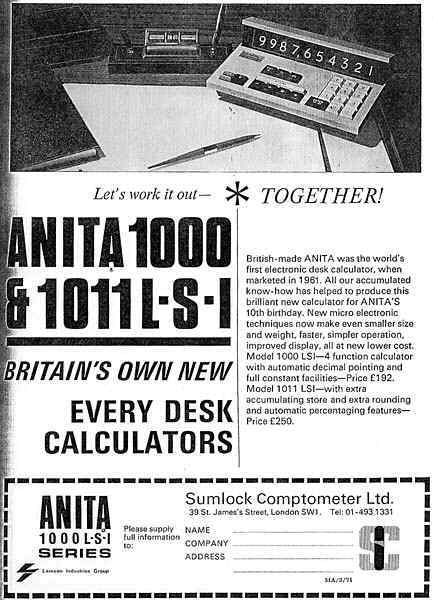 Advertisement for ANITA 1000 LSI & ANITA 1011 LSI from February 1971.